Unnatural is a fantastic mix of sweetness and angst! I’m a sucker for a good friends-to-lovers story and Joanna Chambers has delivered a great one in this utterly addictive tale. Unnatural is a character-driven story, so it’s fortunate that Ms. Chambers has written two excellent heroes. James is a naturalist, a welcome change from the usual Regency-era hero. I absolutely adored him. His open, honest, and loving nature, his unwillingness to consider his attraction to men “unnatural” just because society says it is makes him impossible to resist. James wears his heart on his sleeve for much of the book, and I loved that about him, though given the time period that very openness could put him in a lot of danger. Iain, on the other hand, is very aware of society – and his father’s – opinion on gay men. Iain has been raised to know nothing but fear, duty, and disappointment. James is the bright spot in his life and Iain is unwilling to lose that friendship by giving into his desire for the person he cares about the most. Because of his conflicted feelings, Iain does make a lot of mistakes with James, pushing him away, but always coming back. Normally that much push-pull would annoy me, but Ms. Chambers does such a great job of showing why Iain acts the way he does that I could see why James forgave him – to a point. It’s no spoiler to say that in the present James has had enough and won’t settle for less than he deserves. Whether or not Iain can give him that is something I’ll leave readers to discover, but I will say that I was practically glued to the story, rooting for James and Iain to get the happily ever after they deserved. The story is structured so that readers go back and forth (with the dates clearly marked) between James and Iain’s past and present, starting with their initial meeting as children. Watching their relationship develop from friendship to something infinitely more complex, seeing the pleasure, fear, hope, mistakes, and pain unfold makes the story all the more powerful. Their present – the part where we hope to see Iain and James get their happily ever after – relies heavily on their history, so while I’m not normally a fan of constant back-and-forth, it really worked for this book (though I do wish we got a bit more time in their present). 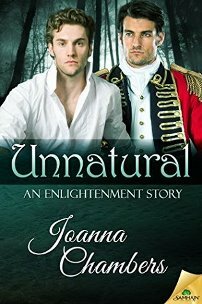 Unnatural is part of Ms. Chambers’s Enlightenment series, and since I haven’t read the first three books (David and Murdo’s romance) I can safely say that this story can be read as a standalone. David and Murdo do appear, which should please fans of the series, and after seeing them in Unnatural I definitely want to read their books. But I’m even more interested in seeing the intriguing Kit Redford again, so I hope Ms. Chambers has more Enlightenment stories planned. If you enjoy historical romances with sweet, likeable heroes, heartbreak, and steamy second chances, then you won’t want to miss Iain and James’s book. I've liked this sweet novel & naturally was glad to meet again our old friends Murdo & David...<3 (You've absolutely to read E. saga, it's simply GREAT, my #1 in this pure period drama genre, frankly even better than this spin-off, because it has it all, smooth writing style, smart plot & engaging MCs. Unexpectedly I've found Jamie the most appealing heroe of our MCs: his the best lines of the novel, plus it's refreshing to see a naturalist in this context, also metaphorically speaking, within the big picture. Only two quibbles: I didn't like the timeline structure so much instead, particularly too chaotic for my taste to keep track of the feelings linked to a specific time (I know that she put always the date & ages on every chapter but it's not enough, it kills the emotional natural flow).